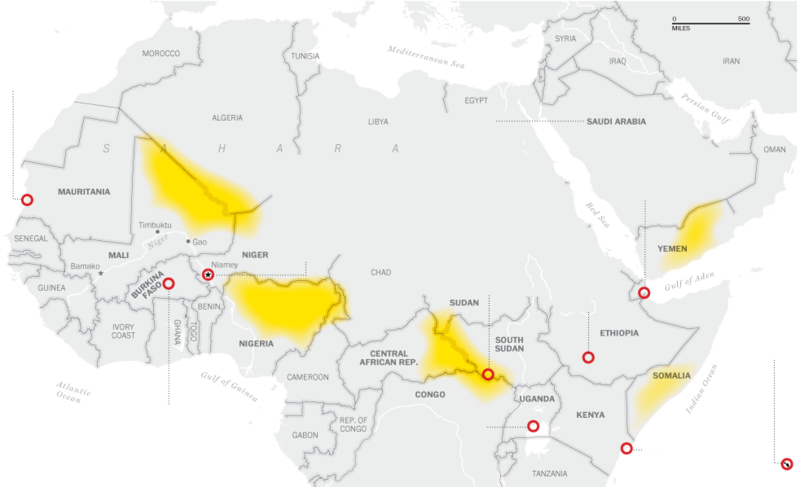 Home 5 Afrique 5 View from Washington regarding Boko Haram: Is it a FTO? Recently a Press Event was held at the National Press Club in Washington, D.C. by CANAN (Christian Association of Nigerian-Americans.) There was a specific reason for the timing of this event. It is hoped that the United States will take similar action to what has recently been taken by Great Britain regarding the Terrorist Group Boko Haram. In fact support for Boko Haram is now a Criminal Offence in the United Kingdom. So why is there such a huge disconnect between London and Washington in this matter? Nigeria had the 4th number of Suicide Attacks committed around the world. The above picture show areas of Islamist Militancy. It appeared earlier this year in the Washington Post. 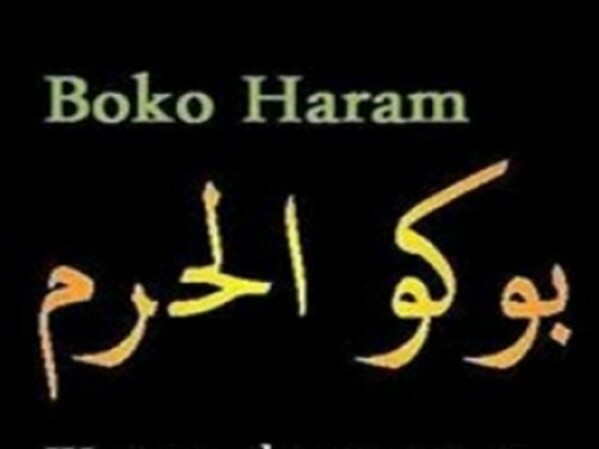 The AOO (Area of Operations of Boko Haram in Northern Nigeria and the region are plain to see. So what is the current criteria that is being used by the State Department to define a Foreign Terrorist Organization (FTO)? According to their website This is determined by the Secretary in accordance with Section 219 of the Immigration and Naturalization act as amended. The goal is to Play a critical role in our fight against terrorism and are an effective means of curtailing support for terrorist activities and pressuring groups to get out of the terrorism business. (emphasis author). There are Legal Definitions that must be made also. engaged in terrorist activity as defined by section 212 (a)(3)(B) of the INA, or terrorism as defined in section 140(d)(2) of the Foreign Relations Authorization Act, Fiscal Years 1988 and 1989 (22 U.S.C 2656f(d)(2) or retain the capability and intent to engage in terrorist activity or terrorism. The organization’s terrorist activity or terrorism must threaten the security of U.S. Nationals or the National Security (National Defense, Foreign Relations or the Economic Interests) of the United States. The policy that is currently in place sounds straight to the point. Lets see how Boko Haram fits into this criteria. The sticking point right now is whether or not Boko Haram is a threat to the National Security of the United States. One area of concern should be the potential threat to Petroleum Imports from Nigeria and even inspiring or raising funds from Acts of Piracy in the Gulf of Guinea. In fact there is belief that Boko Haram is resupplying by sea as well. The group also played a role in the Mali debacle as well. By now we know all of the sordid details. A poorly executed Military Offensive in the North of Mali led to the deaths of over 100 troops. A coup by Junior Grade Officers then followed which in turn led to an offensive by a force composed of Tauregs and Islamist Fighters who had just recently seen action in Libya. This action led to the loss of one-third of the Nation to Islamist Forces. After an intervention by a forced comprised of the French and Regional actors which led to the recapture of the lost territory, elections were then held to restore a democratic Government. It was widely reported that Boko Haram sent 150 fighters to the eastern Malian City of Gao. According to some reports they actually reinforced the Malian Militants who captured the city. In fact they also took part in the fighting when the International Force recaptured the city. In a disturbing report the Nigerian Militants took their weapons with them when the fled to Nigeria after the successful French attack. This means that not only did the group probably receive training from AQIM (Al-Qaeda in the Maghreb) and their allies but they may have been able to recruit former fighters from the fighting in Libya that removed the previous regime. The United States considers Nigeria to be a key partner in Africaso what action will the Obama Administration take to support this key ally? In a recent visit to Abuja the Undersecretary of State for Political Affairs told the United States-Nigeria Bi-national Commission Regional Security Working Group that in order to achieve its potential as a stable regional leader then Nigeria has to capture and prosecute leaders of Boko Haram. Undersecretary Sherman said that the group offered no practical solutions to the problems that plague the Northern States but seek to capitalize on frustration, religious differences and economic and social difficulties to make the country ungovernable. So how should the US assist in this effort? 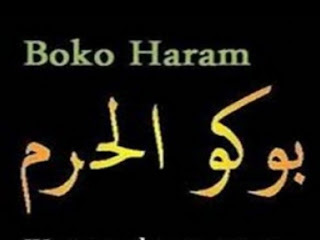 It is not a slam dunk argument to have Boko Haram declared an FTO. It appears that the question the State Department is wrestling with is whether or not the Group is an Insurgency using the tactics of terrorism? Or is it a terrorist group masking its actions as an Insurgency? But if its not an FTO why then should the State Department issue a bounty then for senior leader Abubakar Shekau totaling $7 Million? This sounds so much like the way Washington seeks to address a problem it really wants to go away. That is to throw some money at it and hope for the best. But what about the role that Congress can play? At this time there are two pieces of legislation on the Hill that seeks to have the State Department find that the Islamist group is a FTO. On the Senate side is S 198 introduced by Senator James Reach of Idaho back in January of this year. The bill calls upon the Secretary of State to determine whether or not BH meets the criteria of an FTO, but not infringe on the sovereignty of Nigeria to combat militant or terrorist groups operating within its borders. Rep. Chris Smith of New Jersey who is the current chairman of the House Foreign Relations Subcommittee on Africa is preparing to introduce similar legislation on the House side. There is a trap here. At this time there currently zero Democratic Co-Sponsors. Therefore this could fall victim to the current Political Climate that permeates Washington. It is obvious that it is in the National Security Interest of the United States to support the Nigerian Government. Defeating this insurgency should be a key part of doing so. So what is the State Department waiting for? There has been talk of Religious Freedom as a key role in US in our Foreign Policy. If so why the silence? or Is it waiting for word of American Casualties from an attack? 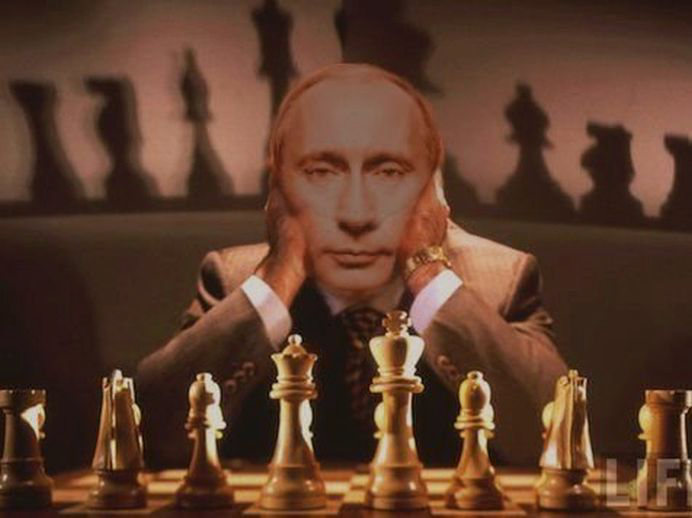 Previous: Are the United States of America preparing for nuclear war in Syria? (pp) thank you mr morgan. mais c’est vrai ils ont le même drapeaux que les autres mercenaires est ce un hasard? je ne le pense pas c’est un réseaux financer par les mêmes a savoir les el saoud, les qataris, et en dernière instance is ra hell n’oublions pas que c’est la même famille qui vouent le même culte a BAAL ou Lucifer c’est la même chose tout comme les francs maçons! franc mac = sabbathéist = is ra hell. allez voir la légende d’Horus ça vaux le coup d’œil :)! vous trouverez une similitude avec l’histoire de jésus chez les chrétiens qui se sont fait abuser par les anciens prêtres qui officié dans les temples et oui! que ferait t’ils pas pour l’argent et le contrôle des masses! désoler pour cette petite séquence théologique mais vu que le sujet traite des merdeux qui tuent, pillent, violent au nom de l’islam autant remettre les pendules a l’heure! ils bruleront avec les autres! (pp) ça aussi ça vaux son pesant de cacahouète! 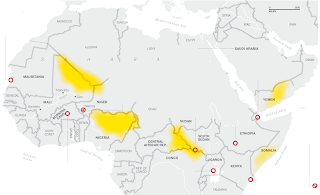 J ignorais que ce groupe terroriste très actif, bien implanté et important existait au Nigéria, et pire avait des ramifications dans le sahel. D apres ce que j ai cru comprendre il est considéré par l angleterre comme un groupe terroriste, mais pas, par les etats unis. D ailleurs un de leurs critères pour considérer qu un groupe est terroriste ou pas, est qu il doit etre étranger. A croire qu il n y a jamais eu d attentats en amérique (oklahoma city, jeux d atlanta etc). Mais les etats unis en la matière, sont les plus grands terroristes dans le monde. nobody comment this article maybe because nobody feel concerned by Boko Haram. why do you guys publish only weird articles in english? like this one and the one before. prenant un autre exemple l’organisme gouvernementale américain de lutte contre l’esclavage épingle l’Algérie comme la Russie alors que le Maroc avec l’esclavage sexuel qui se déroule avec l’avale de son roi n’émeut personne ou pire les pays du golf que tt le monde connait leurs pratiques inhumain mettrais en effroi le pire des esclavagiste sudiste américain ds le 19eme siècle ne sont même pas citer. Suis d accord avec toi sur le debut mais certainement pas la fin, et la tu fais le jeu de nos ennemis qui ne revent que de nous voir divisés, et détruire notre pays. D abord, il faut rappeler que le nord de notre pays était occupé en permancence par des invasions successives, vandales romains byzantins etc Pourquoi, parce que les tribus berberes, passaient leur temps à se guerroyer, facilitant le travail et la pérénisation de l occupant. Sont venus les arabes dans le cadre de leur conquete musulmane, ils ont réussi à rassembler tout ce beau monde, grace à la religion musulmane et la langue arabe, qui ont été et demeurent des vecteurs d unification et de consolidation de la cohésion du peuple. Sur la question de l esclavage, bien entendu qu en arabie cette pratique existait, et encore ce n était que les riches qui pouvaient se le permettre. Mais il n y a jamais eu de génocide, il y a eu des mauvais traitements cela ne fait aucun doute. Mais rien à voir avec le génocide commis par l occident, encore une fois il faut le rappeler que les negociants negriers et autres assureurs qui vont impulser cette traite, sont des juifs ! Ce sont des dizaines de millions de noirs qui vont faire l objet d une traite, beaucoup sont morts durant leur transport comme du bétail, sans compter les mauvais traitements et crimes qu ils subiront en amérique. D aure part, nous n avons pas à nous en prendre aux arabes du golf, encore qu il faille distinguer les peuples des gouvernants, nous ne devons en vouloir qu a nous memes, ce sont des algériens qui dirigent le pays, pas des seoudiens ou des qataris que je vomis du reste. Et faut il le rappeler, ces pays du golf à notre différence sont plus developpés, et leurs peuples vivent très bien. Enfin par rapport à la conjoncture internationale, printemps sioniste, situation en Syrie, bref le chaos dans le monde arabe, il faut comprendre qu il s agit bien d une entreprise de destabilisation et non une revoltion authentique qui amenerait la justice l egalite le bien etre la democratie, nous le voyons bien qu il n en est rien dans aucun pays qui a été la victime de ce complot machiavélique sioniste. Et pourquoi des pays pseudo musulmans, agissent dans le sens de la politique sioniste, tout simplement parce que les monarchies du golf, et principalement celle de l arabie saoudite, est tout sauf arabe et musulmane, il est prouvé que les saouds sont issus d une tribu juive. Donc il ne faut pas s étonner que ces imposteurs, ont inventé le wahabisme pour détruire l islam, et servir les interets d isra hell, et d une manière générale le sionisme. La véritable révolution et elle aura lieu, se déroulera sur la terre sainte en Arabie, et elle sonnera le glas d isra hell. (pp) bien vu 🙂 la clef de voute c’est l’Arabie des saoude je ne dirai pas Arabie saoudite! c’est l’Arabie tout cour! Ce groupe est moins connu qu’alquaida,parcqu’il n’a pas de ramifications régionales et internationales. Son combat se limite à l’intérieur du Nigéria contre les installations pétrolières et les endroits de cultes chrétiens. Sa doctrine est un peu obsure. Je ne pense pas qu’il mérite un débat en ce moment précis,alors que nous vivons des événements brulants de par le monde Arabe:Tunisie-Lybie-Egypte et en particulier Syrie ces jours. جبهة التحرير الوطني من المفروض أن تكون هده العبارة مقدسة بالنسبة أو لدى جميع أفراد الشعب الجزائري لما قدمته (ج ت و) من خدمة جليلة للشعب و للأمة في الماضي نعم تذكروا معي ما جاء من حديث بين الأفراد المؤسسين مصطفى بن بولعيد و كريم بلقاسم و محمد بوضياف و الآخرين(حسب ما رأيناه في الفلم ) رحمهم الله و أطال في عمر دا الحسين لأنه كان من بينهم . هل في حزب جبهة التحرير اليوم فرد واحد يمكن تشبيهه بواحد من هؤلاء ؟ لا اعتقد مع الأسف ، فمحل حب الوطن أصبحت تملؤه اليوم الأنانية و المحسوبية و الجهوية و… محبة الكرسي ليس لخدمة الجزائر و لكن لتخريب الجزائر نعم لسرقة أموال الجزائر، لإفقار الجزائر، لإهانة الجزائريين و إلا فكيف يطمع أمي أن يحكم الجزائر ( 40 مليون نسمة تقريبا، 2 مليون و 3 مائة ألف كلم مربع) في القرن الواحد و العشرين.خمسون سنة من الاستقلال تعلم خلالها الملايين من أبناء الجزائر ما شاء الله من العلوم القديمة و الحديثة وبرعوا في جميع لغات البشر و الحيوان وفي آخر المطاف يولى عليهم اجهلهم ليعتو في الأرض فسادا و يعتدي حتى على كلام الله جل جلاله من خلال خطاباته البهلوانية. يا أيها الذي تتهكم في خطاباتك على كلام الله للمرة الثالثة جهلك و جهل أمثالك بقيمة وقدر كتاب الله هو ما جعل “علي بلحاج” و “عباسي مدني” و غيرهم من الدمويين و السفاحين و الطماعين و المتكالبين على البلاد من داخلها و خارجها يستخفون بالسلطة و يطمعون في الحكم و الإستلاء على ثروات الأمة بعدما ينصبون أنفسهم ملوكا و أمراء و يقومون بذبح جميع المخلصين من أبناء الجزائر و كذلك كل البهائم من أمثالك . 8;رب الويسكي واكل المشوي و الشطيح و الرديح كان هؤلاء يبيتون في المساجد يجمعون و يعدون مستغلين جهل الجهلة منكم إلا أن الله كان اعلم بنواياهم فما أعانهم و جعل نهاية حلمهم على يد المخلصين من أبناء الجزائر كما سيجعل نهايتك القريبة إن شاء الله لأنك تتحداه بجهلك إذ تستهزئ بآياته في خطاباتك التي لا قيمة لها فأنت ربما تحاول أن تلمح انك مفرنس ( فوتها كما يقولون) فتتهكم على لغة القران و الله ما أنت بمفرنس و لا بمعرب و لا أنت بمثقف و لو ثقافة بسيطة لأنه لو كنت كذالك لأدركت أن التطاول على الله من اكبر الكبائر. لا يفعلها لا المسيحي ولا اليهودي ولا البودي ولا الملحد و الله لا يفعلها إلا جاهل. أما الباقون من هؤلاء فإنهم تحولوا إلى “حلابة” و” بارونان مخدرات ” و مغتصبي أطفال و قطاع الطرق و غيرهم لأنهم يتشبهون بساستهم اللذين لا يحترمون القانون و لا يطبقونه لأنهم لا يؤمنون به لذالك هم لا يتذكرون القانون و لا يذكرون به. شعارهم في ذالك ” اعطيهولي فاهم و لهلا قرا” و الله إني لا اعرف من أين تأتي الفهامة لواحد أمي لا يستطيع تكوين فكرة أو التعبير عنها ولو بجملة مفيدة بسيطة من فعل و فاعل و مفعول به لا بالعربية و لا بالفرنسية و لا حتى بالامزيغية . أول مرة حكم فيها البلاد واحد أمي(جبهاوي) كلنا نتذكر 13 سنة من الجهل التام و الظلامية ، أهينت خلالها البلاد و الأمة و انداست خلالها كرامة الجزائر و الجزائيين ،كما أخليت الخزينة بالخيانة و السرقة حتى أفلست الجزائر و أثقل كاهلها بالديون الخارجية و وصلت خلالها البلاد إلى الهاوية حتى كادت أن تفقد كيانها واستقلالها وتعود إلى عصور الجاهلية الظلامية . 75;ت المؤمنين من الشيوخ و العجائز و عادت بعض العافية إلى البلاد و كادت تنهض من وعكتها جماعة الجبهة اللي اغلبهم دخلاء عليها يغضون البصر مرة أخرى على كل ما يجري في البلاد من منكر وكل ما يحاك ضدها و ضد شعبها في الداخل و في الخارج على كل الأصعدة السياسي و الاقتصادي و الأمني و الثقافي والاجتماعي و غيرها و يكادون يرفعون السلاح في وجوه بعضهم البعض مناجل الزعامة سبحان الله واحد سنه فوق السبعين ، طاب جنانه، مدا بقي له في هذه الفانية لا تخافون أن يأتي أحدكم الموت بغتة و هوا يخطط للكسب و النهب من خلال إسناد الحكم إلى الأميين و الجهلة اللذين يجهلون أن القانون لا يحمي الجهلاء لا في الدنيا و لا في الآخرة. افهموا يا ناس روحوا تريحوا تتوبون الى الله قبل فوات الأوان ، سلموا المشعل للشباب القاري المتكون الحامل للعلم و المعرفة شوفوا للدول الأخرى المتقدمة الحكام فيها شباب القانون فيها هو السيد ، فيها العدالة و الديمقراطية بريطانيا مثلا . Un petit hors sujet, j avais des doutes quant à la determination de l état algérien dans sa lutte contre les traffics à la frontière notamment d essence. Eh bien, confirmation m est donnée aujourd’hui, des gens que je connais bien reviennent d un sejour de saidia pres d oujda, ville à la frontière qu ‘ils ont également visité. C est d ailleurs curieux de voir des algériens regarder la frontière coté marocain lol ! Alors que disent ces braves gens, à travers des discussions qu ils ont eu avec des marocains, notamment un entrepreneur marocain, que l essence algérien ne passe plus la frontière, non seulement des citoyens marocains mais également des entrepreneurs se plaignent. Cela a aussi, on s en doutait un peu, a généré un sentiment antipathique vis à vis des algériens avec les insultes que l on connait. En tout cas, cette lutte a porté ses premiers fruits, mais néanmoins met en difficulté l est marocain dans la difficulté. Après, tout, puisqu ils sont mieux que nous parait il, eh bien qu ils se debrouillent, ni essence ni gaz ni produis de première consommation, chacun chez soi, et les vaches seront bien gardées.